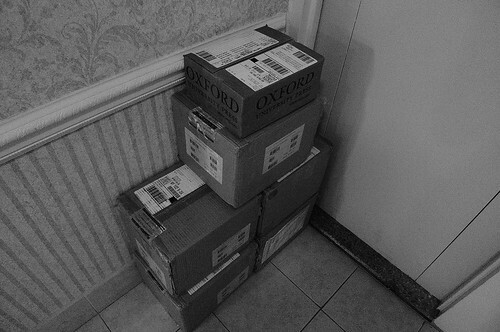 say what you will about beautiful families, adoring dogs, and cottages left intact after dragon attacks, but from where i'm sitting, the very best greeting at the end of a long day comes from a stack of boxes from the oxford university press. ALL YOUR WORD ARE BELONG TO US. I am SALIVATING. JESUS GOD. JESUS GOD the BOXES. The boxes.